Some merchants enjoy the simplicity of tier-based pricing. Others prefer the fee-transparency of pass through pricing. Unlike many websites that endorse one pricing structure over the other, I believe that both can be the right choice depending on your needs. Regardless of your preference, both pricing models charge merchants different rates for processing different types of transactions. I’ll break down the reasons why certain transactions cost more, including corporate and premium cards. Higher fees often seem arbitrary, but it turns out that there really is a method to the madness. Higher interchange rates originate with the credit card brands. If you’re paying a higher rate for a particular transaction, then your merchant account provider is paying a higher rate, too. The cost to the provider to allow their clients’ customers to make purchases with a particular card is called the “buy rate”. This buy rate accounts for the majority of processing costs, with the provider’s profit being the small percentage and transaction fees that are tacked on. 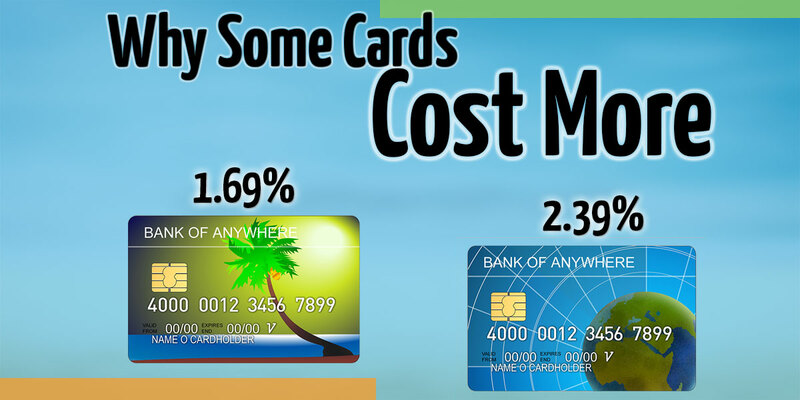 Credit card companies set different buy rates based on how much it costs them to process various transactions. An over-simplification of this cost breakdown is that they need to charge more for transactions that are either higher risk or require customer reward cards. The burden of risk on transactions that are nullified due to a stolen card or any other reason ultimately falls on the credit card company. To hedge their bets, higher interchange rates are assessed based on risk level. Debit cards are low risk because when a card is swiped through a POS device, an approval message is only returned when there are funds currently available in the cardholder’s bank account. This makes sense and is why debit card transactions enjoy the lowest rate. When a customer chooses credit instead of debit, they are essentially granted 30 days to pay their bill. These purchases can be made without any money in the bank, hence the higher risk. Risk levels are determined by complex algorithms, with multiple factors affecting the formula. A transaction where the card is physically swiped through a processing machine carries a lower risk than cases where a clerk manually enters the card number via the key pad. 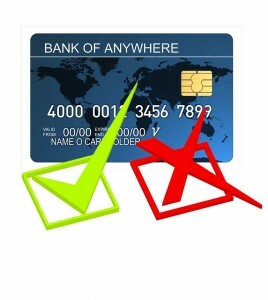 Similarly, transactions where the physical card is not available, present an even higher risk. Examples include telephone or internet orders. Interchange rates are even influenced by a customer opting to use their PIN for transaction approval versus signing the receipt. Requiring customers to provide the 3-digit Card Security Code from the back of the card can often lower the fee. Rate increases from Tier 1 to Tier 2 are significant, but it’s the Tier 3 transactions that’ll leave you stewing over the bill. The average cost for a Non-Qualified purchase is 3.2% to 4.5%. Ouch. All business corporate credit cards and some rewards cards fall under the Non-Qualified category. The reason that corporate cards pose a greater risk is that some information fields normally included for the approval process are unavailable. Business cards are not issued in the purchaser’s name, so neither the buyer’s address nor telephone number can be entered into the system. Reward cards don’t necessarily pose any greater risk to the bank, but the cost of providing the extra benefits to the cardholder are passed down the line to the merchant via higher fees. This might not be fair, but it’s just the way it is. Is there no hope for avoiding tier 3 fees? You can’t prevent customers from paying with a corporate, premium rewards, or international card. Your contract stipulates that you accept all cards under each brand’s umbrella. Some businesses offer incentives to customers that pay with a debit card, but unfortunately some Tier 3 transactions are just a cost of doing business. What you can do is ensure that all transactions are done in accordance with the rules established in your Payment Processing Agreement. Not following security guidelines can cause transactions to be downgraded to Non-Qualified, even if they would have otherwise fallen under the Qualified or Mid-Qualified bracket. I hope this clears up any questions you had about why you’re being charged different rates for different transactions, but if there’s anything you’re not clear just get in touch with us!